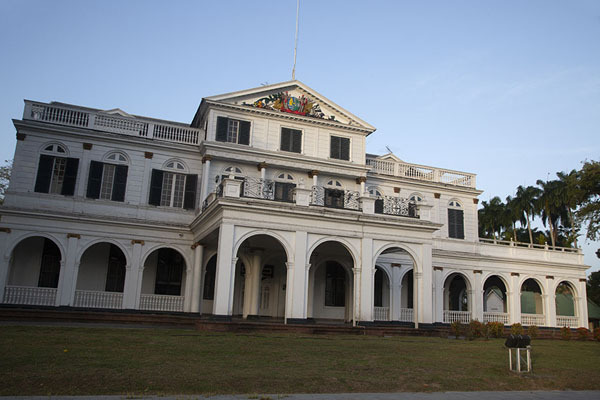 After not having been here for more than twelve years, I am curious to re-visit the historic district of Paramaribo and see if it has changed at all. 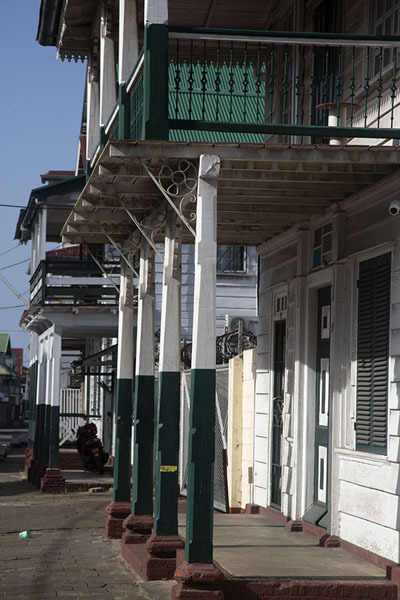 I search my memory for images of the buildings of the capital of Surinam, and when I see the first traditional buildings, those memories come back, and blend in with what I see before my eyes. I soon conclude that not much seems to have changed here. 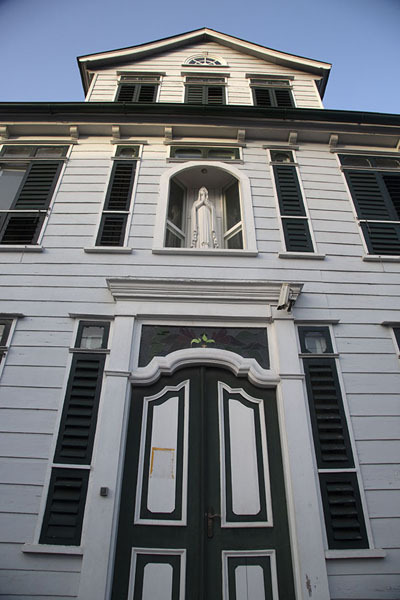 On my way back from a cycling tour on the east bank of the Suriname River, I cross the Wijdenbosch bridge, and after cycling through seemingly rundown outskirts of the city, it is easy to see where the historic district starts. 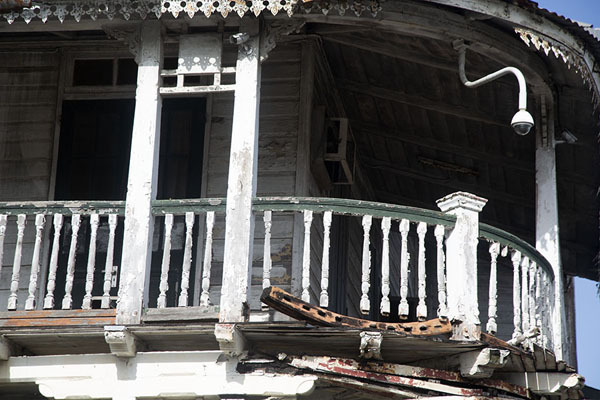 Whitewashed wooden buildings rise above me, and even if some of them have flaking paint, they still have an elegant look, And the good thing is: many of the buildings still survive! 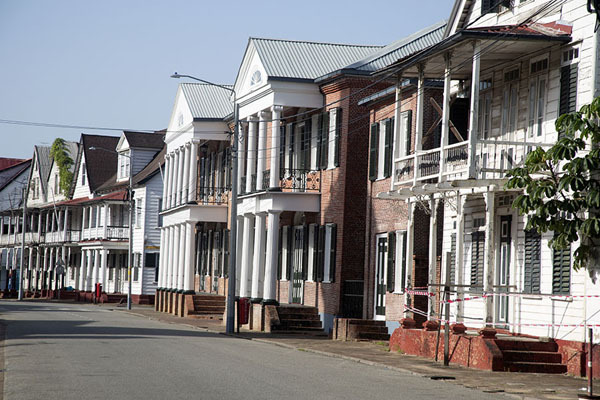 The historic inner city of Paramaribo was declared a World Heritage Site in 2002, and it is easy to see why. 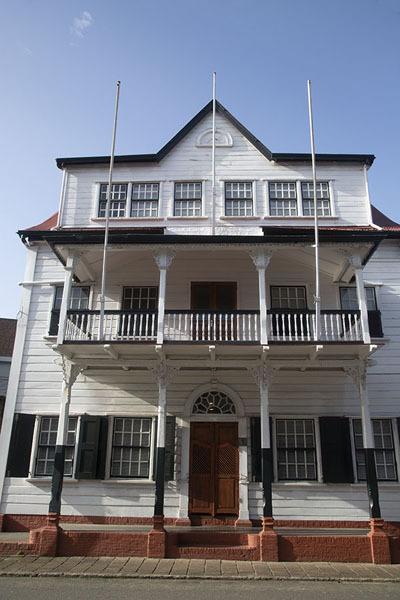 Apart from looking attractive, the buildings are a symbol of the multicultural fusion that is Surinam. 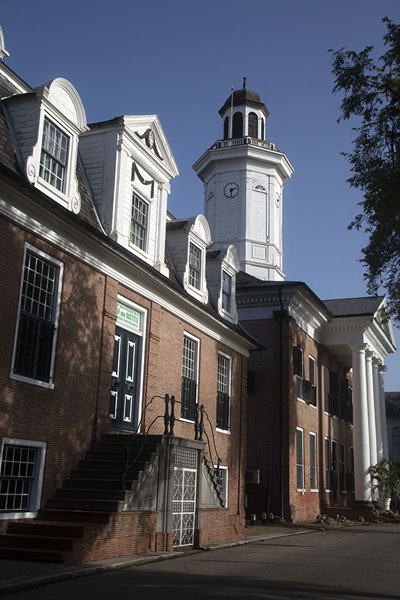 Influences from the Netherlands, the Americas, coupled with those of the local population and building materials make for an original collection of buildings. In some, you can see a brick base topped with a wooden building. 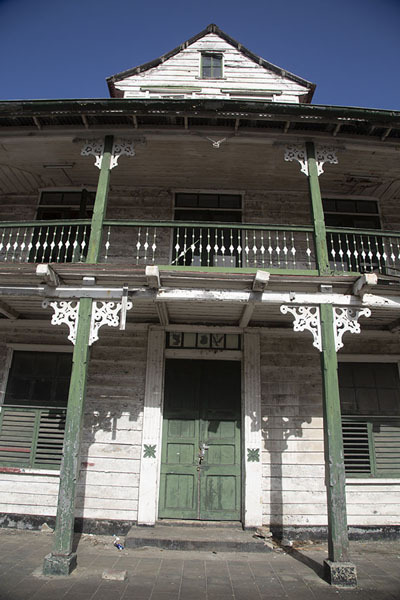 They may have external stone staircases with curly handrails, and elegantly shaped gables, similar to those you might find in The Netherlands. 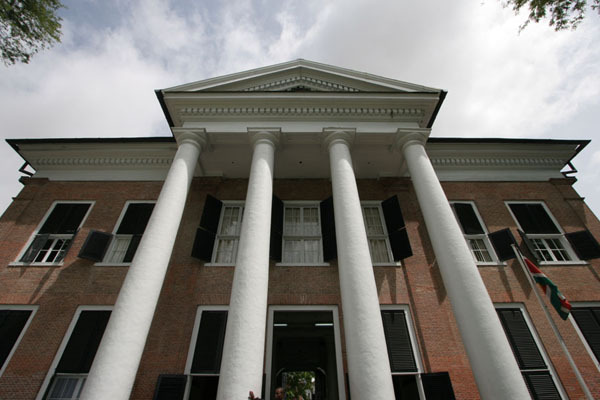 Then, others are completely constructed from wood, and have wooden columns supporting balconies, like you would find in the Caribbean or even southern United States. And then, I do not think I ever saw two identical buildings: they all have their particular character. After cycling around the inner city in the afternoon, enjoying the warm sunlight on the Presidential Palace, I am back just after sunrise the next morning. I have more time now, taking a closer look at the Court of Justice and the Ministry of Finance, two remarkable buildings on Independence Square, and then cycle around without much of a plan, just following my nose and directing my bike to wherever it looks nice. 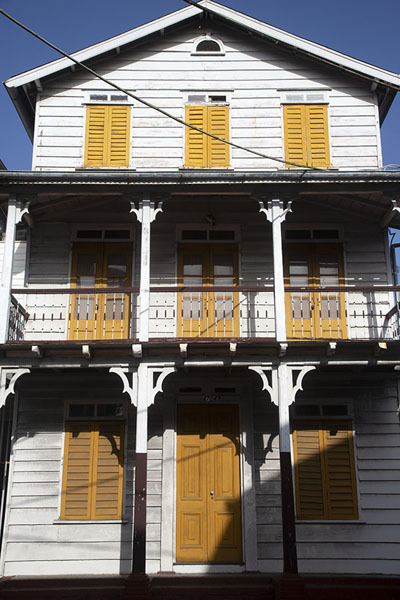 I criss-cross the historic centre, see the sun casting its light on the white buildings, and the coloured shutters. 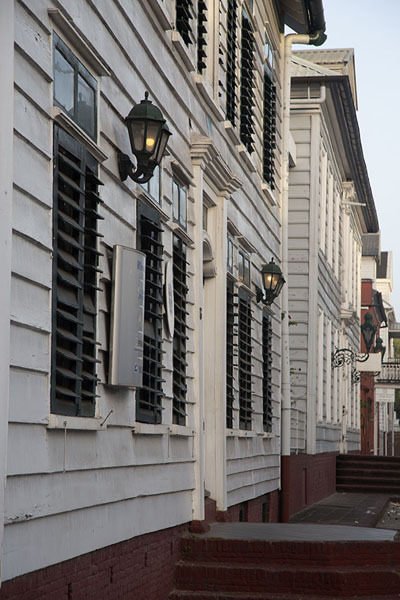 I often get off the bike, and walk around, before continuing on my exploration of Paramaribo. It is a Saturday morning and the streets are all but empty. Sure enough, there are several modern buildings as well, but as long as I stay within the boundaries of the historic district, the streets are filled with architectural beauties. 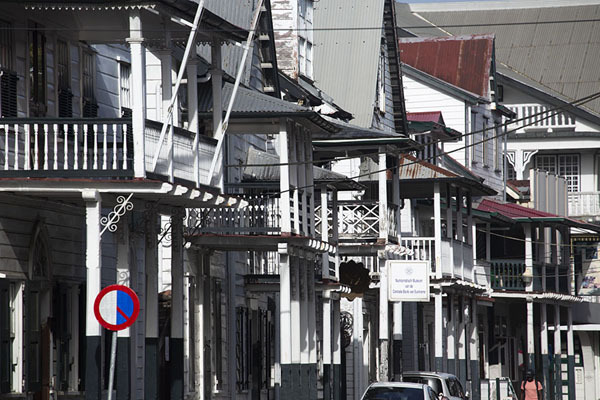 Personal travel impressions both in words and images from Paramaribo Architecture (). Clicking on the pictures enlarges them and enables you to send the picture as a free e-card or download it for personal use, for instance, on your weblog. 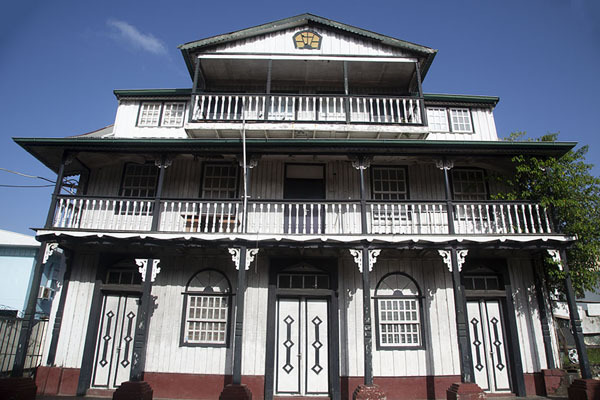 Or click on the map above to visit more places close to Paramaribo Architecture. 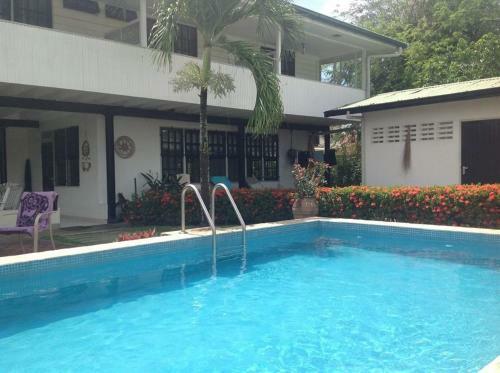 Book a hotel near Paramaribo Architecture, Paramaribo, Surinam with low prices for all kinds of hotels - without reservation fees.